Blair - Blair, 9780895876249, 264pp. Jeremy B. Jones's essay "In Search of Dreadlocks (and Captain Zero)," originally published in Relief, was named a notable essay in Best American Essays 2009, edited by Mary Oliver. His essay "The Resurrection of Ray Jones," originally published in Ruminate, was named a notable essay in the 2011 volume of Best American Essays, edited by Edwidge Danticat. 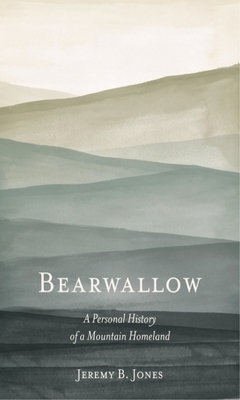 In Bearwallow, his first book, Jones turns his attention to the complex and rich world of his Appalachian past and to understanding how this landscape shaped his own identity. Jones and his wife move into a small house above the creek where his family had settled 200 years prior, and he takes a job alongside his former teachers in the local elementary school. But living at the foot of Bearwallow Mountain after a year in Gracias, Honduras, makes Jones realize he has lost touch with his Appalachian-crafted voice. Somehow, he must "reclaim echoes of a lost voice" and "make a home of two minds." Though he can see "how the mountains rubbed people, how] they'd been shaped by life in the highlands," he can't see it in himself. He asks, "How was I marked? How was I mountain people--how was I my people?" Thus, he sets out on a search that sends him burrowing into the past--hunting buried treasure and POW camps, unearthing Civil War graves and family feuds, exploring gated communities and tourist traps, encountering changed accents and immigrant populations, tracing Walmart's sidewalks and carved-out mountains--and pondering the future. Throughout his book, the parallels Jones draws between seemingly disparate things--like Bearwallow Mountain and Gracias, Honduras--allows him to uncover similarities hidden just under the surface. He meshes narrative and myth, geology and genealogy, fiddle tunes and local color about the briskly changing and oft-stigmatized world of his native southern Appalachians. By doing so, he explores not only the story of his own heritage but also simplistic conceptions of Appalachia and its people. His journey back to the mystical Bearwallow Mountain reveals a peak suddenly in flux.